Grab your pardners for the best hoedown – Scarborough Musicals production of Oklahoma on the stage of the YMCA Theatre. The cast stomp, stamp and sing their way through the Rodgers and Hammerstein story of cowboys and farmers in a swirl of gingham, flower-print, denim and stetsons. Tune after tune – O What a Beautiful Morning, Surrey with a Fringe on the Top, Kansas City, I Caint Say No, Many A New Day, People Will Say We’re in Love and All Er Nuthin’ – are belted out as Curly romances Laurey into his arms and Will tames the wandering eyes and arms of Ado Annie. 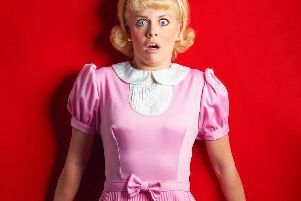 After last year’s Legally Blonde, the company returns to a more traditional show and its success still lies square-dancingly in the hands of the younger members of the cast. There are outstanding performances from Connor Canvess as Curly, Tilly Jackson as Laurey, Georgia Mason as Ado Annie and Nathan Mundey as Will. Connor played Emmett in Legally Blonde – and boy as he matured into a confident leading man with a strong voice, charm and strength as an actor. Tilly, who played Elle in Legally Blonde, brings a depth and seriousness to her role. Georgia is simply divine as flirtatious man-mad Ado Annie – never missing a comic beat or singing a wrong note as she wrung the comedy out of the role. Not to be upstaged Nathan Mundey has never been better as the devoted and dim Will. Older hand Helen Dent brought verve and stability to the production. Dave Blaker – again – shines in a cameo. This time as Jud Fry who represents the darker side of this muscial love story. He was menacing and yet vulnerable as the troubled farm hand and his rumbling baritone is put to excellent use in Pore Jud is Daid and Lonely Room. Let’s hear it for Bob Holmes as Ado Annie’s father Andrew Cairns. He has seldom missed a show for decades and here gets his moment in the spotlight singing the Farmer and the Cowboy – and is priceless. Chris Taylor – who helmed Scalby School productions including Miss Saigon – takes up the reins as director and plays pedler Ali Hakim to great comedy effect. He keeps the production pacey and allows the darker moments to linger the more for the audience to feel the tension – and relief when the joy once again abounds. The ensemble liven up the song and dance numbers, choerographed superbly by Sheryl Buttner, and there is also a lovely cameo from Casey Canvess as Gertie – the girl with the most irritating laugh in the world. Musical director Robert Schmuck also does an outstanding job on keyboards. Scarborough Musicals’ Oklahoma will go down as one of its most outstanding productions of recent years. It is a traditional musical which Chris and his cast – young and not so young – has given freshness and vibrancy. The closing number Oklahoma was roof-liftingly rousing and left the audience begging for me. Cast: Connor Canvess, Tilly Jackson, Helen Dent, Nathan Mundey, Georgia Mason, Dave Blaker, Rebecca Boag, Michelle Rayner, Kirsty Sheader, Mollie McPhearson, Robin Newman, Pauline Newman, Hattie Pridmore, Michelle Blackstone, Elaine Allc roft, Amy Hitchcock, Terry Johnston Chaten, Mike Wademan, Bob Holmes, Kath Mundey, John Hazelwood, Kath Mundey, Casey Canvess, Sheryl Buttner, Chris Taylor, Jo Banken, Maria Bowtell, Natalie Ellis, Elaine Evans, Steve Wity, Bob Gibbon, Linda Green, Anita Hill and Pamela Hill. It runs at the YMCA until Saturday June 2, daily at 7.30pm with a matinee on Saturday at 2.30pm.